Some of the credit for the band’s more expansive sound surely goes to Brian Burton, the producer and musician who goes by Danger Mouse. Burton is half of the duos gnarls barkley and broken bells, and has produced albums by Beck, Gorillaz and the Black Keys’ 2008 album, “Attack & Release.” He also helped shape “Tighten Up” on “Brothers.” This time,danger mouse signs on as a co-writer, too, and merging his eclectic pop instincts with Auerbach and Carney’s rock ’n’ roll muscle makes for a formidable combination that seems certain to cement the Black Keys’ steady transition from scrappy indie band to bigtime rock ’n’ rollers. 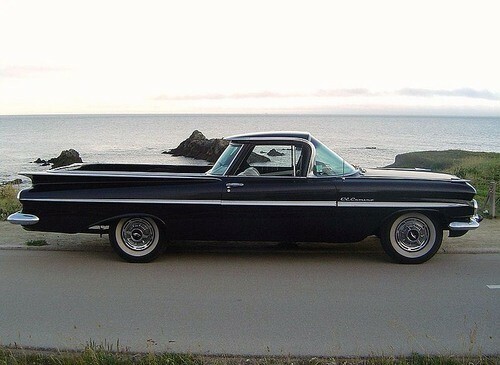 In case you didn't know the car below is an el camino which is also the name of the black keys latest album which became availible on december 6th just in time for santy.